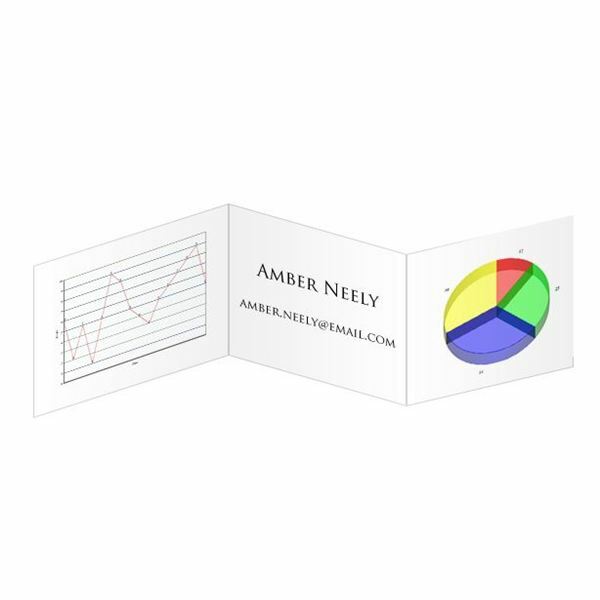 Accordion fold business cards are a relatively newer kind of card. They consist of a card that has been folded two or more times to create a card with multiple panels. 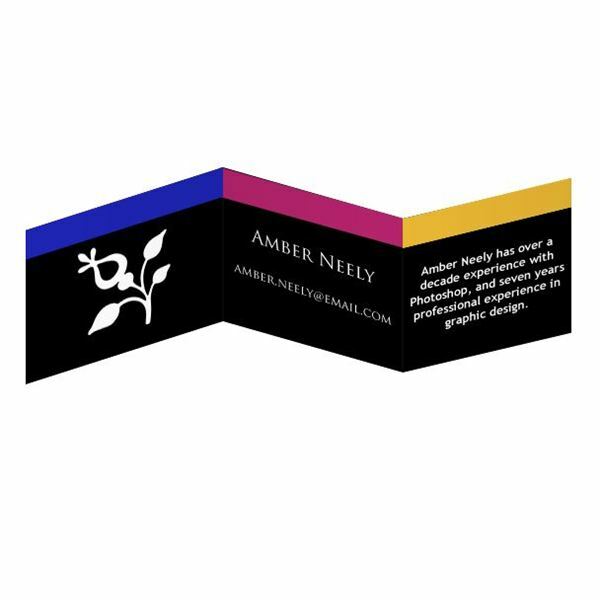 The diagram below shows how a business card might look when unfolded. These generally serve more of an artistic purpose rather than a practical one, but as you'll soon learn, there are a lot of different ways this card can be both artistic and practical! When a business card has an accordion fold to it, people will probably be more inclined to pick it up. We're so used to small, bland pieces of white cardstock that are passed around back and forth while networking, that we often lose the ability to distinguish between one card and the next. Cards that provide a unique experience, be it texture, artwork, color, design, or – yes – even unique folds, separate themselves from those bits of paper that get thrown into desk drawers and forgotten. 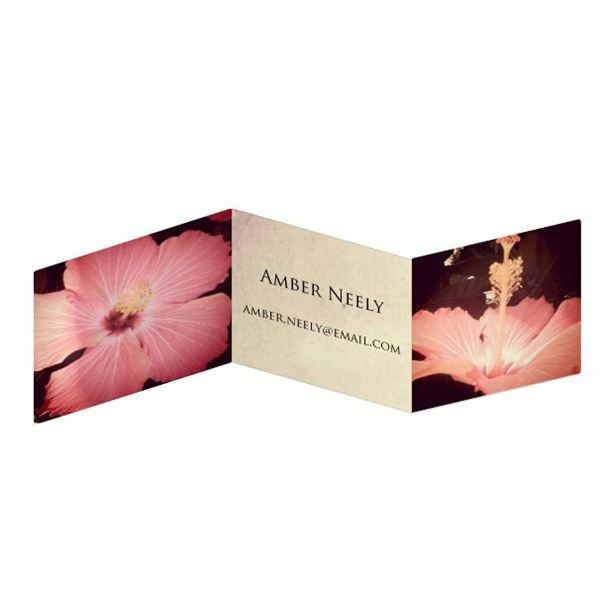 Accordion cards have the unique advantage of offering several panels, meaning you can fit more information, more artwork, and more pizazz onto a piece of paper that will fold to be the same size as a business card, but with much more to offer! Accordion fold business cards are far from standard, so if you're looking to get a set of these professionally printed, cut, and folded, you're probably out of luck. This means that you will have to go the route of printing them yourself, or working one on one with a printer, which can be a bit costly. Accordion fold cards are also an irregular shape, meaning that you can fit less of them per sheet of paper, and they'll be likely to use more ink. On top of that, because they're a unique shape, they're going to take more time to fold, and you're probably going to have to do it by hand. Still, the effort can pay off in the end if your cards are picked up more often! One of the nicest things about the accordion fold is that you can provide artistic flare thanks to the extended panels. For example, a card folded two times provides six working surfaces, rather than the two working surfaces of a standard card. This can allow for some very interesting choices when it comes to design. You can provide multiple decorative images, a unique one on each panel, or you can do a piece of artwork that spans across three panels. You could even tell a story across three, four, or five panels (remember to save one panel for your contact information) like a storybook or a comic strip would do! Another fantastic way this card can be utilized is to showcase small versions of work that photographers, designers, and artist have done. Think of this card as a mini-portfolio or gallery that you can show off to the world! Of course, accordion folded cards aren't without their place in the practical world, either! With all that extra space, think of all the information you could fit on that card! This is a great place to put charts, graphs, pictures of products, testimonials, or pricing packages! Of course, you need to remember that you're still designing on a very small card, which means that you need to keep the information basic and the text at a size that is still easily read. These kinds of cards are great for people who offer services that come in "packages," such as lawn care professionals, dog groomers, catering services, and many more. Just think how nice it'll look when a prospective client picks up your card and can see all the different options you offer! Who says that you can't have a business card that is a marriage of form and function? No one, that's who! You can easily create a card that uses both artistic images and design, as well as information about you and your business. Remember that you want to make this card look good as well as provide adequate information about you, your business, your products, or the services that you offer. Take some time to plan your card on some scrap paper and see what designs feel right to you. After all, you want to design a card that you can be proud of, as well as a card that others will want to pick up and hold on to! All images and information are provided by Amber Neely, who has over a decade experience with Photoshop, and seven years professional experience in graphic design.